Federal Reserve officials may start winding down their stimulus program -- a process Wall Street has dubbed "tapering" -- for reasons other than an improving job market. "Participants also considered scenarios under which it might, at some stage, be appropriate to begin to wind down the [bond-buying] program before an unambiguous further improvement in the outlook was apparent," minutes from the last Fed meeting in October said. Tapering for any reason other than a stronger job market would mark a dramatic change from the Fed's stated policy. Since last September, the central bank has been buying $85 billion in bonds each month with one goal in mind: substantial improvement in the job market. If the officials start to doubt the effectiveness of that policy or believe the risks outweigh the benefits, they would have to completely change their tune, and doing so could rattle markets. They're not at that point yet but discussed that scenario in detail at the meeting. For now, most Fed officials still believe the bond-buying program has more help to offer the economy. They also believe the job market will continue improving and "warrant trimming the pace of purchases in coming months." Fed officials also discussed other ways they could continue stimulating the economy. According to the minutes, some officials said they would like to announce they will keep short-term interest rates low well after the unemployment rate falls to 6.5% -- their current stated goal. Perhaps the Fed should aim for an even lower unemployment rate, they said. Meanwhile, another stimulus option, which had been off the table for a while, resurfaced at the October meeting. The Fed could consider reducing the interest rate it pays on the excess funds banks store at the Fed. 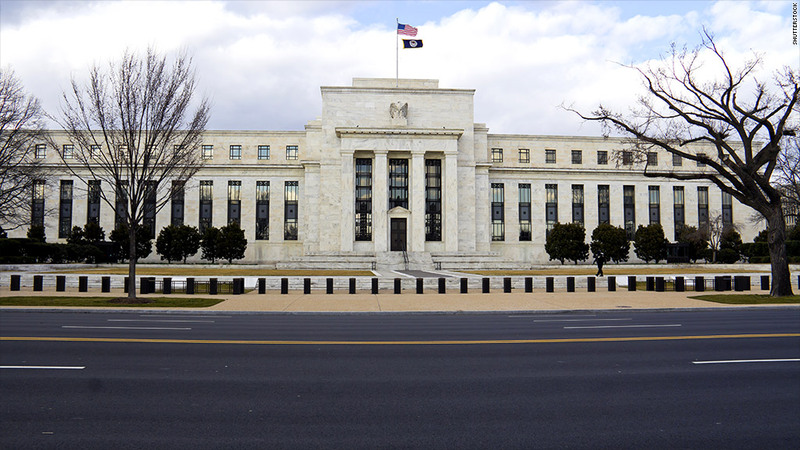 The Fed currently pays banks 0.25% interest on excess reserves they park at the central bank. By lowering that rate, banks may have more incentive to lend that money out. The minutes noted that most participants thought it "could be worth considering at some stage, although the benefits of such a step were generally seen as likely to be small except possibly as a signal of policy intentions." The Fed's current bond-buying spree marks its third round of 'quantitative easing' since 2008. Unlike the first two rounds, this one doesn't have a set end date. Investors have become obsessed with trying to predict when the Fed will start reducing the program. Those forecasts have been jumping around wildly. Over the summer, guesses focused on September. Then, after weak economic data and the government shutdown, forecasts settled on March 2014, and now after the October jobs report came in stronger than expected, some economists have switched their prediction to December. Stocks fell slightly Wednesday afternoon, as investors interpreted the minutes as one more sign that the Fed stands ready to taper sooner rather than later.